It’s been very strange to be out here in Kuwait. Unfortunately, I’m carless in a country where EVERYTHING is tied to driving. It’s worse than living in a suburb, it’s more like living in the country without a car! There’s not a lot to “do” unless you count shopping and eating as major activities. I’ve always wanted to find other things, and we’ve found a few, but in the end I can’t wait ’till I get a car when I come back from vacation. Speaking of which, I have never looked so eagerly towards a vacation! [fergcorp_cdt_single date=”June 23, 2010, 1400″] I had gone to New York! Those of you that can be around, please contact (at Virginia’s phone)/ come and visit! I’ll only be in the States for 2 weeks, about 9 days of which is going to in NY, and the rest in MD. I already don’t want to come back, and I haven’t even left yet! It’s going to go by really REALLY fast! Gorillaz – Plastic Beach – Stylo video – cars! I know I’m late to this party!! Just getting around to listening to the Gorillaz album Plastic Beach, which was released back in March. I’ve heard the excellent track Melancholy Hill before thanks to Jason or Hasan whoever it was– but wow the rest of the album is equally excellent! Many artists will feature all sorts of cameos, but these guys– their superstar list includes some awesome big names– really put together SUCH a coherent sound through the album. It makes me want to go buy a car so I can drive around and listen to this music. Speaking of cars– I am loving the video to Stylo– featuring two classics, and Bruce Willis. Can’t go wrong. The ’69 Camaro SS (convertible) that the band is driving has the same surreal look as the semi-animated band members themselves. Meanwhile, Bruce gives chase with what looks to be a ’67 El Camino. Both gorgeous, and all totally badass. On a slight side-note, if you haven’t seen their appearance on the Colbert Report, it’s a yes. 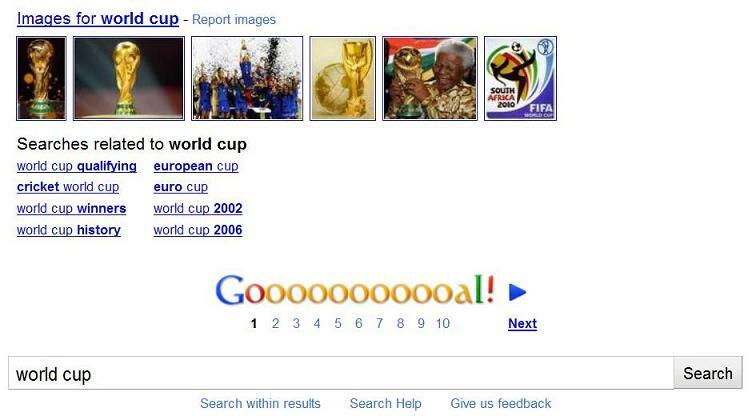 Google is having a fun contest asking children around the world to come up with the best “doodle” for the Google logo celebrating the special time of life that is the World Cup season! “We’re inviting 4 to 17 year olds from around the world to exercise their creative imaginations around the theme: “I love football”. Around most of the footballing world, this contest is known as the “love football” contest. When I couldn’t find the contest page for the US, even though I found a bunch of other countries from around the world (below), I thought maybe it’s called something about soccer. As it turns out, the Australian competition is called “I love soccer” but still nothing for the US! If someone finds this please let me know, until then I’m very disappointed that even though soccer is probably the most played sport among children of the competition age in the US (4-17), they don’t have this competition open for us! Meanwhile, we’ll enjoy some of the nice designs children elsewhere came up with! Awesome song, awesome video: "I Feel Better"
I don’t know if these guys are getting any airtime in the States, but I have found this fantastic song/video– the band is called Hot Chip, and even though their other videos are quite crazy-looking, this one takes the cake. It was directed by Peter Serafinowicz, and according to Boingboing, was released on March of this year. Who, by the way, has a pretty awesome blog. “I’m directing the next HOT CHIP MUSIC VIDEO! WOULD YOU LIKE TO BE BACKGROUND CROWD IN AN AMAZING NEW MUSIC VIDEO FOR HOT CHIP? There will be refreshments but NO Pay! Many Thanks it’s going to be a great video. I guess I wouldn’t complain about being on a music video being broadcast internationally either! But really– they were ready to release the video just weeks after the shooting?! Anyway– enjoy!